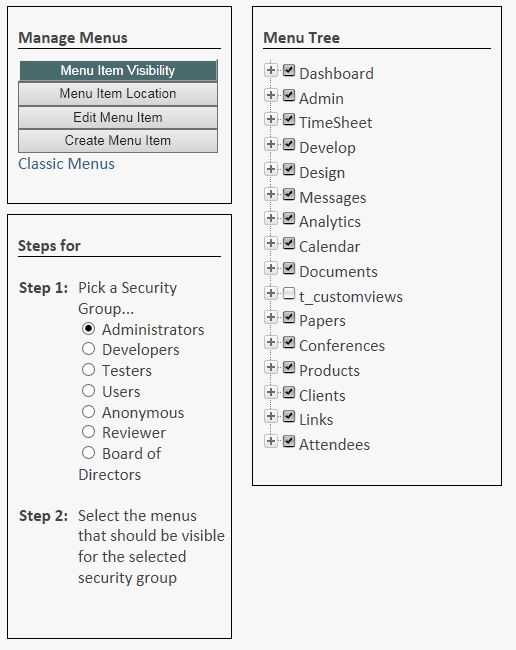 Group Menu Visibility sets the visibility of Menus by User Groups. To change visibility of all menu tabs for a group go to Develop > Manage Menus. Click the button at the top that says "menu item visibility". Select the user group you want to set menu visibility for. 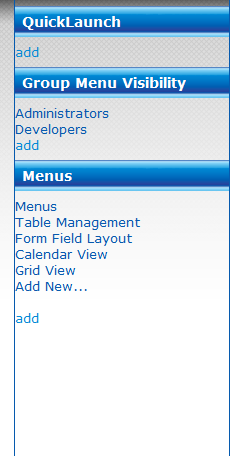 Click the checkboxes on the right next to the menu items to make a menu tab visible to the user group. You can click the plus to show sub-menus. Note: A user will only be able to see a table linked to in a menu if they have permissions to the table under Table Security. The old way of editing Group menu visibility. If you are on a mobile device, you can use this method to edit menu visibility. Go to Develop > Menus > on the left click the "Classic Menus" link. Click the name of the Menu Item. You are now in the detail view for that item. On the right (the Footer), you will see a link that says "Group Menu Visibility". If any User Groups have permission to see the menu tab, you will see them listed here. You will also see a link that says "Add", click it to add menu tab visibility for more user groups. 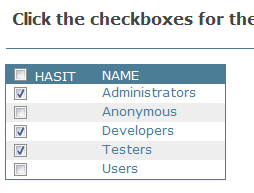 Use the checkboxes to toggle visibility on or off. Note that Group Menu Security does not limit your users from accessing your tables. Hidden menu tabs can still be accessed if a user types in the /db.aspx to a table. For complete security set up Table Security.